Brown Ale was first made in England in the 1700s. Colonel Porter concocted a Newcastle Brown Ale in 1929, which has become synonymous with the city. Today, several local craft brewers have created wonderful new versions. 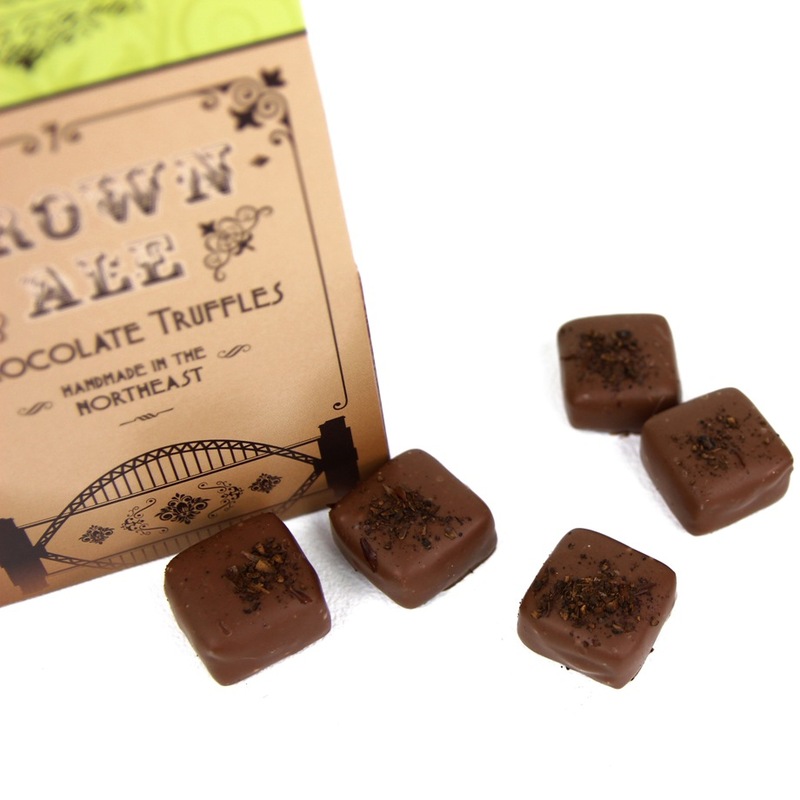 Our inspired chocolate truffles, celebrating this heritage, are handmade in our artisan chocolate factory in the North East. 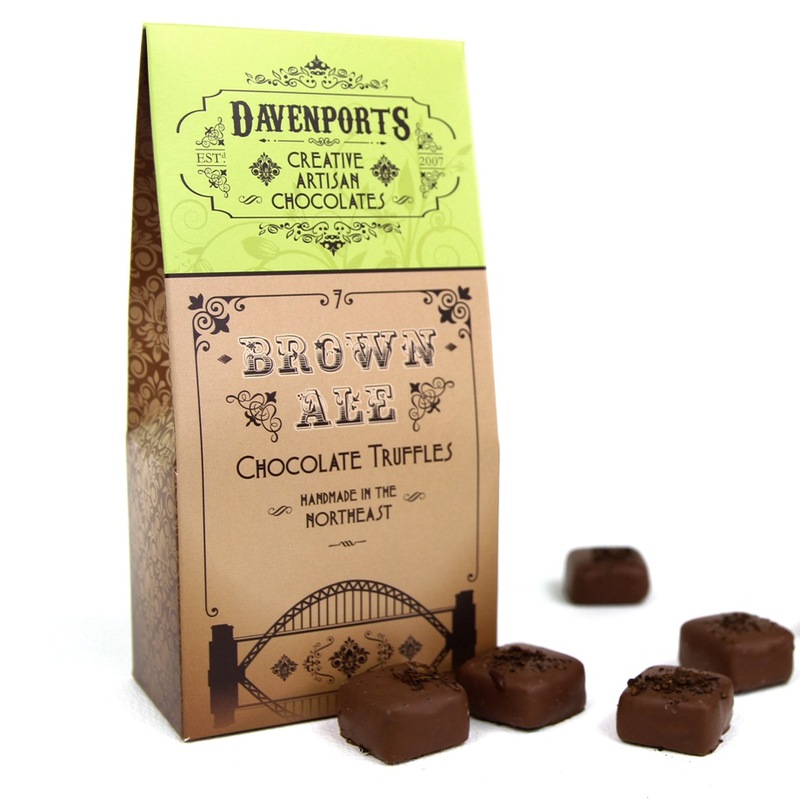 Our Brown Ale Chocolate is a dark chocolate ganache made not only with Brown Ale, but with an infusion of extra roasted chocolatey malts. 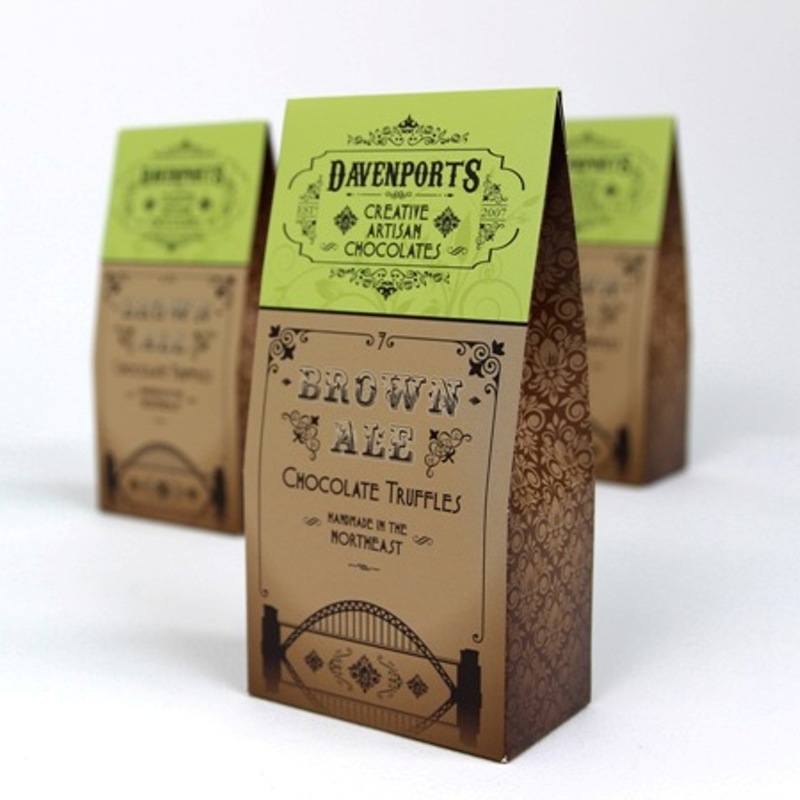 It is enrobed in smooth milk chocolate, and topped with a sprinkle of roasted malts to deepen the flavour. Our satchel boxes make perfect gifts for anyone wanting to share a taste of the North East. Dark Couverture Chocolate (cocoa Mass, Sugar, Cocoa Butter, Emulsifier: Soya Lecithin, Natural Vanilla Flavouring) (Milk, Soya), Couverture Milk Chocolate (Sugar, Cocoa Butter, Whole Milk Powder, Cocoa Mass, Emulsifier: Soya Lecithin, Natural Vanilla Flavouring) (Milk, Soya), Brown Ale ( (Water, Malted Barley, Glucose Syrup, Barley, Hops, Hop Extract)), Butter (Milk), Glucose, Malt Extract. Per 100g: Energy 1911.5kJ, Energy 456.4kcal, Fat 30.5g (of which saturates 18.5g), Fatty Acids Monounsaturated 9.6g, Fatty Acids Polyunsaturated 1.0g,Trans Fatty Acids 0.3g, Carbohydrate 37.6g (of which sugars 34.1g), Fibre 4.2g, Protein 4.2g, Salt 0.15g, Sodium 59.2mg.